Practically everyone loves muffins, but most of us also know that they are usually packed full of fat, processed sugar, and calories. 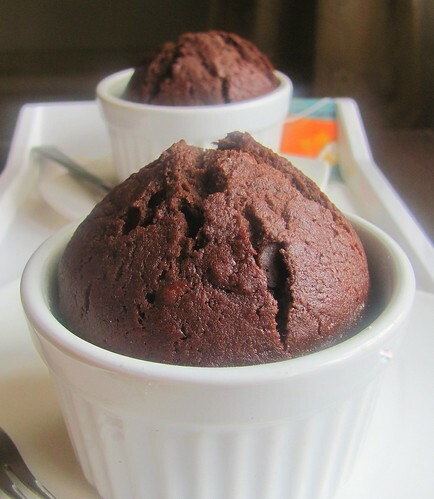 Here is a healthy, vegan alternative muffin recipe. They pair perfectly with freshly brewed organic teas and black coffee as well. Try ‘em out and enjoy! I know I have. Preheat the oven to 400 degrees. Line 12 muffin tins (depending on the size of the muffin tins) with paper liners. If you don’t have paper liners you can rub the insides of the cups with waxed paper; however, this doesn’t work as well as the paper liners. Combine your dry ingredients – flour, oats, brown sugar, cacao, baking powder and baking soda – together in a large bowl. In a separate bowl combine the mashed bananas, almond milk, vegan margarine, and vanilla thoroughly. Add the wet ingredients to the dry ingredients and stir until they are completely combined. Spoon the batter into the prepared muffin cups. Bake the muffins at 400 degrees for 20-25 minutes. After removing the muffins from the oven allow them to cool, preferably on a wire rack. The recipe make 12 medium sized muffins. Enjoy these healthy, superfood rich muffins! This recipe is brought to us by the wonderful chefs at chooseveg.com. We altered a few things in order to heighten the nutrition content, making it optimal for your body’s consumption. Check out their site for some more delicious vegan recipes.